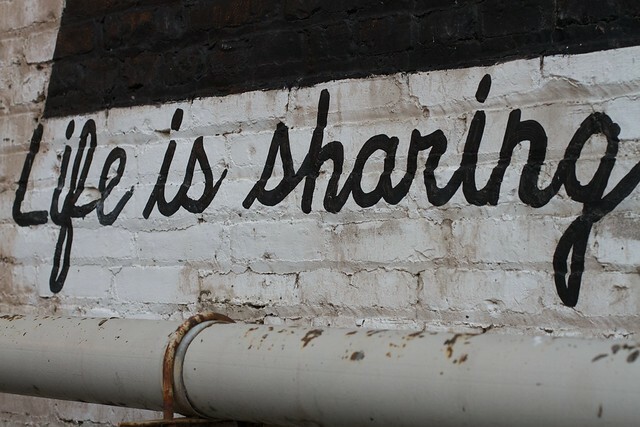 Life is Sharing | Flickr - Photo Sharing! Part of a Cleveland mural, the full saying was "Life is sharing a park bench"
swanksalot, jeremy.boye, biblioupm, and 46 other people added this photo to their favorites. Thanks for using creative commons! I would like to use this wonderful photo for a section about the economy in a non-commercial site. I will credit "Alan Levine". Thank you! Thanks for letting use this photo, Alan. I've included it in a post for our blog Kangapp (blog.kangapp.com/es/consumo-colaborativo-y-ninos/). I've credited the picture and linked it. We have used your image on our Facebook page, going live 14/1/2016, with credit to you.